SHANGHAI (Reuters) – Faltering Chinese markets dented Asian stocks in a choppy Friday morning, just hours before Washington is set to impose tariffs on Chinese imports that many investors fear might trigger a full-scale trade war in a blow to the global economy. Around 0215 GMT, MSCI’s broadest index of Asia-Pacific shares outside Japan was 0.3 percent lower, pulling back from a modest early rise. The index has lost 8.8 percent since June 7. 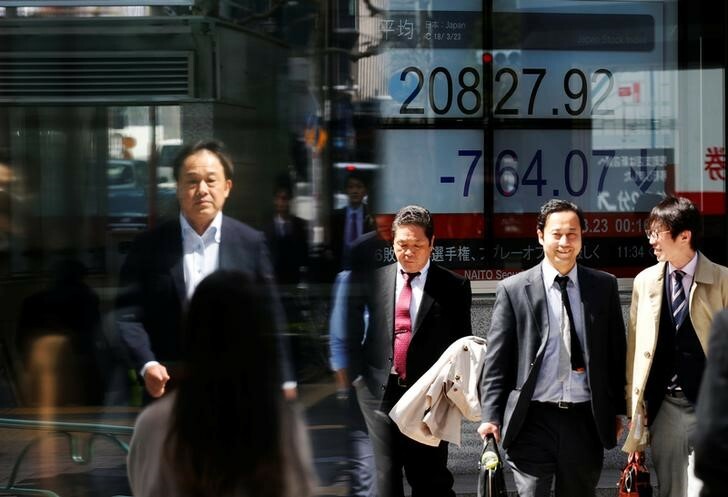 Seoul’s Kospi index fell 0.2 percent and shares in Taiwan were 0.4 percent lower. Australian shares were up 0.4 percent. China’s major indexes were choppy in early trade, with the blue-chip CSI300 index in and out of negative territory. It was last 0.2 percent lower, while the index fell 0.3 percent. Japan’s stock index was 0.7 percent higher after closing at a three-month low on Thursday. The yield on benchmark 10-year Treasury notes was at 2.8364 percent, compared with a U.S. close of 2.84 percent. The two-year yield, which rises with traders’ expectations of higher Fed fund rates, was at 2.5527 percent compared with a U.S. close of 2.561 percent. Gold, which is sensitive to rising interest rates, was 0.2 percent lower. traded at $1254.43 per ounce. The dollar was up 0.1 percent against the yen at 110.72. The single currency was down a hair on the day at $1.1682, while the , which tracks the greenback against a basket of six major rivals, was flat at 94.474.
fell 0.2 percent at $72.80 a barrel. was 0.4 percent lower at $77.08 per barrel.